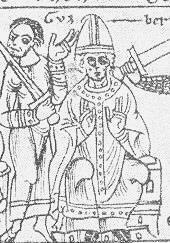 Guibert or Wibert of Ravenna (c. 1029 – 8 January 1100) was Antipope from 25 February 1080 to his death. He was born in Parma and had family connections to the Margraves of Canossa. A cleric, he was appointed to the Imperial Chancellorship for Italy by the Empress Agnes in 1057, which position he held until 1063. In 1058 he participated in the election of Pope Nicholas II but on his death in 1061, he combined with the Imperial and Transpadine Anti-Reform party to create Cadalous of Parma as Antipope Honorius II against Pope Alexander II. However, owing to the campaigns of Duke Godfrey of Lorraine, Archbishop Anno of Cologne, and St. Peter Damian, the Church by-and-large rejected Honorius II and acknowledged Alexander II; probably as a result of these activities, the Empress Agnes dismissed him from the Imperial Chancellorship of Italy. Guibert laid low for the next nine years, but apparently continued to cultivate his contacts within the German court, for in 1072, Emperor Henry IV named him Archbishop of the vacant see of Ravenna. And, although Pope Alexander II was reluctant to confirm this appointment, he was prevailed by Hildebrand to do so, perhaps as a compromise for peace. Guibert then took an oath of allegiance to the Holy Father and his successors and was installed at Ravenna in 1073. Shortly after Pope Alexander II died and Hildebrand was elected the next pope, being installed as Pope Gregory VII on April 29, 1073. Guibert attended the first Lenten Synods of Pope Gregory in March 1074 in Rome, and at which important laws were passed against simony and the incontinence of the clergy, but soon emerged as one of the most visible leaders of opposition to the Gregorian reforms. It was in this same year that Emperor Henry IV began his open war on Gregory. At a synod held at Worms in January, 1076, a resolution was adopted deposing Gregory, and in this decision the simoniacal bishops of Transpadine Italy joined. Among these must have been Guibert, for he shared in the sentence of excommunication and interdiction which Gregory VII pronounced against the guilty Transpadine bishops at the Lenten Synod of 1076. Shortly after, in April 1076, bishops and abbots of the Transpadine anti-reform party convened at Pavia under the presidency of Guibert and proclaimed the excommunication of Gregory VII; a messenger, bearing a most offensive personal letter from Henry, was dispatched with the Pavian reply to the pope. In response, Gregory was compelled to resort to still stronger measures with regard to Guibert; he excommunicated Guibert by name at the Lenten Synod of February, 1078, and with him his main accomplice Archbishop Tebaldo of Milan. Gregory's measures against Henry provided an opportunity to the nobles of Germany who were discontented with him and they began steps to depose him, thus rendering Henry's position precarious. At first he was encouraged by his party to resist, but his friends, including his abettors among the episcopate, began to abandon him, and the Saxons revolted once more, demanding a new monarch. At a Congress held at Tibur by the German spiritual and temporal lords, in October, 1076, the election of a new emperor was canvassed. On learning through the papal legate of Gregory's desire that the crown should be reserved for Henry if possible, the assembly contented itself with calling upon him to abstain for the time being from exercising administrative offices and to avoid the company of those who had been excommunicated, but declared his crown forfeited if he were not reconciled with the pope within a year. It was further agreed to invite Gregory to a council at Augsburg in the following February, at which Henry was summoned to present himself. As the majority of the princes of the empire now took sides against the king, Henry urgently sought to be reconciled with the pope, and consequently travelled to Italy in the middle of a severe winter, in order to meet the pope there before the latter should leave Italian soil on his journey to Germany. Abandoned by his own partisans and fearing for his throne, Henry fled secretly with his wife and child and a single servant to Gregory to tender his submission. He crossed the Alps in the depth of one of the severest winters on record. On reaching Italy, anti-reform Italians flocked around him promising aid and assistance in his quarrel with the pope, but Henry spurned their offers. Gregory, who was already on his way to Augsburg, had already arrived in Lombardy when he heard of the king's journey; fearing treachery, Gregory retreated to the mountain stronghold of Canossa for security. Henry followed him there, but the Pope, mindful of his former faithlessness, treated him with extreme severity. The excommunicated king requested Countess Matilda, his mother- in-law Adelaide, and Abbot Hugh of Cluny, to intercede with the pope for him. On their intercession, and after long opposition, Gregory permitted Henry to appear before him personally at Canossa and atone for his guilt by public penance. Stript of his royal robes, and clad as a penitent, Henry had to come barefooted through ice and snow, and crave for admission to the presence of the pope. All day he remained at the door of the citadel, fasting and exposed to the inclemency of the wintry weather, but was refused admission. A second and a third day he thus humiliated and disciplined himself, and finally on January 28, 1077, he was received by Pope Gregory and absolved from censure, but only on condition that he would appear at the proposed council and submit himself to its decision. After the king's departure the pope set out for Mantua. For safety Countess Matilda accompanied him with armed men, but hearing a rumour that Archbishop Guibert of Ravenna, who was unfriendly to Gregory, was preparing an ambush for him, she brought the pope back to Canossa. Henry then returned to Germany, but his severe lesson failed to effect any radical improvement in his conduct. Disgusted by his inconsistencies and dishonesty, the German princes on March 15, 1077, elected Rudolph of Swabia to succeed him. Gregory wished to remain neutral, and even strove to effect a compromise between the opposing parties. Both, however, were dissatisfied, and prevented the proposed council from being held. Henry's conduct toward the pope was meanwhile characterized by the greatest duplicity, and, when he went so far as to threaten to set up an antipope, Gregory renewed his decree of anathema and excommunication against Henry in March, 1080. Carrying out his threats, Henry summoned his German and Transpadine partisans to a Synod at Brixen in June, 1080, which drew up a new decree purporting to depose Pope Gregory VII, and which Henry himself also signed, and then proceeded to elect Guibert, the excommunicated simoniacal Archbishop of Ravenna, as antipope in opposition to Pope Gregory; Guibert took the name Clement III. Henry at once recognized Guibert as pope, swearing that he would lead him to Rome, and there receive from his hands the imperial crown. Rudolph of Swabia having fallen mortally wounded at the Battle of Mersburg in 1080. Henry could concentrate all his forces against Gregory. In 1081 he marched on Rome, but failed to force his way into the city, which he finally accomplished only in 1084. However, when the news was brought that Gregory's Norman ally Robert Guiscard Duke of Normandy was hastening to his aid, Henry fled Rome with Guibert and, in revenge for Matilda's staunch support for Gregory and the reform party, ravaged her possessions in Tuscany. The Pope was liberated, but, the people becoming incensed by the excesses of his Norman allies, he was compelled to leave Rome. Disappointed and sorrowing he withdrew to Monte Cassino, and later to the castle of Salerno by the sea, in 1084, where he died in the following year, May 25, 1085. The German episcopate stood divided. While anti-simonical bishops held a Synod in Quedlinburg, at which they denounced and condemned Guibert, partisans of Henry held a rival Synod at Mainz in 1085, where they approved the deposition of Gregory and the elevation of Guibert.